K.Bhagyaraj is easily one of the favorite actors for all mimicry artists. Drumstick and Bhagyaraj are always synonymous. He is known for his specs and witty dialogues. These are the only few things that most of the people born after late 80’sknow about the unsung director/hero Bhagyaraj. Started his career as a script writer and assistant director to the legendary Bharathiraja and debuted as a hero in Bharathiraja’s PuthiyaVarpugal. 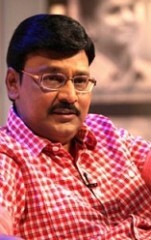 Bhagyaraj debuted as a director in Suvarilla Chittirangal. We shall see few of prolific movies from him. Indru Poi Nalai Vaa was one of the best Rom-com. The witty scenes where Bhagyaraj and his friends try to woo Radhika are hilarious. “Raghu Thatha” scene has attained a cult comedy status. The scene where Bhagayaraj comes in Black Shirt and white pant and the scenes where he helps Gandhimathi in house hold stuff were neatly taken. Antha Ezhu Naatkal, one of the biggest hit for Bhagyaraj. This movie was a great example of the acting skills of Bhagyaraj. He did the role of Palakkatu Mathavan in a perfect manner. Poor, innocent and wanting to succeed in life character was done well by Bhagyaraj. Mundhanai Mudichu is another hilarious and sentimental movie. Drumstick scene is one of best seducing scene which was even liked by family audience. Another cult movie directed and acted by Bhagyaraj is Dhavani Kanavugal. Movie had stalwarts like Sivaji Ganesan and Bharathi Raja. Three best scenes in the movie, the one in theatre where Bhagayaraj throws coin and asks his sisters to search it to make them avoid seeing a romantic scene was really funny. The scene where Sivaji an atheist in the movie prays to God for the wellness of Bhagyaraj would have made many to shed couple of tears. The epic scene was the one where Bhagyaraj enacts a brother sister dialogue to Radhika and the slap he gives to Radhika to make her cry really. Aararo Aariraro is very good movie with lot of good comedy and sentimental scenes in a mental hospital. Movie had a strong message where Bhagyaraj accepts a woman, who was raped by someone else as his wife suggesting that it was not a taboo. Darling Darling Darling is an awesome love story where Bhagyaraj played a role of an underdog. I have to mention about Rudra where Bhagayaraj did the screenplay and hero role. This was the best comedy thriller of that time and screen play was not boring for even one scene. The bank robbery scene was out of box. He has not only done rural and family movies but also directed very good thriller Vidium varai kaathiru and written story for Oru Kaidhiyin dairy and dialogues for Sikappu rojakal. Big reason for success of most of his movies is that his movies always have importance to the female protagonist and lot of scope in acting for the heroine. Few examples are Kalpana in Chinnaveedu, Saritha in Mouna Geethangal, Urvasi in Mundhanai Mudichu, Shobana in Ithu Namma Alu and Bhanu Priya in Aararo Aariraro. Many of Bhagyaraj’s directorial are dubbed in Telugu, Kannada and Hindi clearly showing how good his movies were. With so many hits as a director and hero he should have attained stardom in Kollywood but unfortunately he didn’t. He is truly an unsung hero/director of Tamil Film Industry. Lollu Sabha members come together! This page has information about Unsung Hero/Director Bhagyaraj, Bhagyaraj.